In a paper published August 2015 Journal of Allergy and Clinical Immunology, Dr Jonathan Silverberg studied an association between eczema and headaches. The cause of headaches could have come from (i) sleep disturbances or (ii) fatigue that eczema children suffer from. Method of study: Analysis of data from 401,002 children and adolescents in 19 US population-based cross-sectional studies from the National Survey of Children’s Health 2003/2004 and 2007/2008 and the National Health Interview Survey 1997-2013. Results: From the analysis, eczema was associated with headaches in 14 of 19 studies. It was found that eczema children had a higher prevalence and likelihood of headaches. 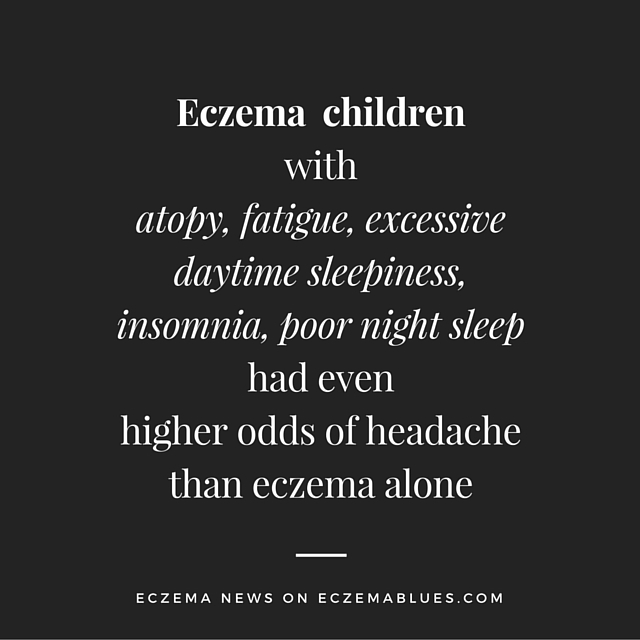 In particular, children with eczema that was associated with atopy, fatigue, excessive daytime sleepiness, insomnia, and only 0 to 3 nights of sufficient sleep had even higher odds of headache than eczema alone. In adults, we may reach for the painkiller but this probably isn’t suitable for a child and can’t be taken long-term. Possibly explore antihistamines to see if it help with a better night sleep and of course, treating the eczema to reduce the itch. I’ve recently found that dry wrap (as opposed to wet wrap which I have not tried) seemed to reduce the scratching at night. Singapore is pretty humid so instead of wet wrap, sometimes I put a layer of moisturizer (again) before sleep time, and put over a wrap bandage. Marcie’s skin usually appear better the next day and there’s less scratching on the wrapped spot at night. More on wet wrap in link.